When it comes to traction products there are all kinds of opinions. Some riders believe that more is better. Some believe traction products are essential. Some riders never consider adding traction aids to their tracks in the belief that it will lessen the track’s life. Generally speaking, all of these attitudes are correct. Adding traction products to a sled’s track provides additional bite on ice and helps out when braking. But cutting holes in a track to accommodate traction products can lessen track life. There is another consideration; some states forbid the use of sleds equipped with track studs on certain designated trails. Riding style helps determine the type of traction setup you need. If you primarily ride trails and opt for added traction, know that what works for a lake racer or hill climb specialist may not be best for you. In many cases, the average trail rider may be better off upgrading his ski’s wearbar and forgoing track studs. If you ride a lot and find your sled ‘darting’ from rut to rut on the trail, you might seriously consider wearbars designed specifically to minimize darting. If you are an aggressive trail rider, you might want to look at balancing your sled’s handling with a more aggressive set of wearbars and a matching complement of track studs. Lake racers look for instant grip off the line and will seek out extreme traction options. 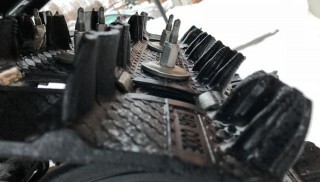 Fortunately, today’s traction options can accommodate every level of snowmobile rider. Since we figure that most racer type riders already have a handle on what traction needs they require, we’ll look at some options for the rest of us. International Engineering’s ‘Woodys’ Brand is one of the oldest names in snowmobile traction. The company offers products for everyone from professional level racers to recreational trail riders. The Woodys Dooly wearbar was designed to help cut down a ski’s tendency to dart from side to side as it hunted for the ski track of snowmobiles that had gone before. As riders regained directional control and confidence in their sleds, they wanted an upgrade in ski handling. Woodys created its new Slim Jim Dooly which embodies the anti-dart capabilities of the original yet adds cornering control. The Slim Jim Dooly, available in carbide lengths of 4, 6 and 8 inches, has a 60-degree turning carbide. 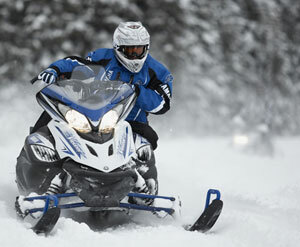 There are brand-specific wearbars to fit Arctic Cat, Polaris, Ski-Doo and Yamaha snowmobiles. The Woodys Extender Trail III Series with its 7/16-inch diameter runner is popular for trail riding. The Extender Trail III replaces the manufacturer’s stock runner and offers four inches of 60-degree turning carbide for cornering control. The makers of Stud Boy brand traction products also offer wearbar options for a wide variety of riding styles. The company’s Deuce Bar is a performance oriented dual runner bar that features the concave design benefit of the firm’s Shaper Bars. Stud Boy claims that its Deuce Bar offers the advantage of no darting as it creates its own groove and eliminates dual runner type drag. The durable one-piece design won’t clog with snow, ice, or rocks. It is available in lengths of 4.5”, 6”, and 9” of 60-degree cutting carbide to fit most popular snowmobiles. The former Saber Traction line is now sold factory direct through Accord Racing Products LLC of Jackson, Wis., which offers other wearbar options. Its version of a double runner wearbar is said to have twice the carbide of competing versions. There are front and rear wear pads to help give the ski the ‘feel’ of power steering. While optional ski wearbars help, there is the option of adding studs to your track. 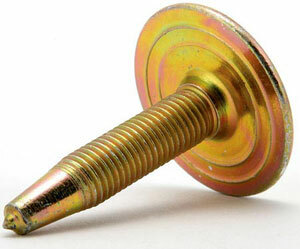 Fortunately all the major suppliers of track studs offer ‘how to’ sections on their product web sites. As one supplier notes in its ‘First Time Stud Users Guide’: Under-studding causes most traction related problems. We suggest that if you are not going to stud the track yourself you seek out the advice of a trusted friend or snowmobile club member who successfully uses studs; ask your local servicing dealer; or speak directly with a traction manufacturer’s technician at the company’s help line. Even if you have used traction products before, don’t be embarrassed to ask for assistance. Today’s rider-forward sleds often have unique requirements that you may not have any idea about. It is the job of the traction manufacturer to know which of its many products works — or doesn’t work — best on a specific snowmobile. In general, if you are a recreational rider, you’ll look at a general application traction product, leaving the super-grip studs to the racer-types. You’ll want a good performing, durable stud that not only gives you a safety edge, but also will last well enough that you are not replacing studs before every ride. 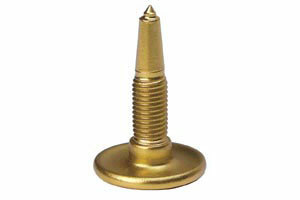 Woodys offers its line of Gold Digger studs. One of the oldest names in traction, the modern Gold Digger features a sharp 60-degree carbide tip that offers excellent all-around traction and durability on hard-pack snow and ice. Gold Digger Traction Master studs are available in a variety of stud lengths with a head designed not to pull through the track. The design is heat treated and available in 24, 96, 144 and 1000 piece packages that include lock nuts. Stud Boy products include the “Power Point” +PLUS carbide stud specifically designed for Ski-Doo’s XP and the Camoplast Single Ply track. This addition to Stud Boy’s Power Point carbide push-thru studs is a design that features a 60-degree carbide tip for aggressive penetration, and chamfered head design to reduce vibration and idler wheel wear. The Wart Hog is a series of studs sold factory direct by Accord Racing Products. The Warthog XZP features a one-inch head with a durable 68-degree point. A limited warranty claims the product will not bend or break. Made of heat-treated, high-strength alloy steel, the Wart Hog stud is available in a variety of lengths and is sold in package quantities from 24 up to 1,000 pieces. When looking at snowmobile traction options, check out the product information for your specific sled. Also keep in mind, that the combination of sled and rider weight as well as your specific riding style has as much importance in selecting traction options, as does your sled’s horsepower. For pricing and more product information, check out: Woodys at http://www.woodystraction.com/; Stud Boy at http://www.studboytraction.com/; and Snow Studs (Accord Racing Products LLC) at http://www.snowstuds.com/.